Like most who have a pet project, I have invested more time and money into HeroCraft than I care to admit at this point, and there is a very large and real fear of hearing negative things about it. Although I've made efforts to expand my pool of playtesters, it was definitely time to get some professional feedback. I have the fortune of knowing Dave Wessman, game designer and board game aficionado, and invited him over Tuesday night to test Herocraft. Dave's experience and knowledge of board games is astounding, and since he's a colleague and friend, getting his opinion was a nice stepping-stone to releasing the game into the wilds. We tested with four players and timed the session; after explaining the rules and including several interruptions, the final time was two hours and ten minutes. It was also worth noting that I finally won at my own game, despite two other players being much more powerful than myself! The game had some anomalies in the rolls, but otherwise went fairly well. When the game ended I asked for Dave's critiques and prepared to hear the worst. The biggest complaint was the ratio of luck and strategy. In most cases replayability comes from random elements, and it's a trade off I consciously made. Dave's opinion was biased, he said, because his favorite games are war-simulations that have little (if any) luck involved. 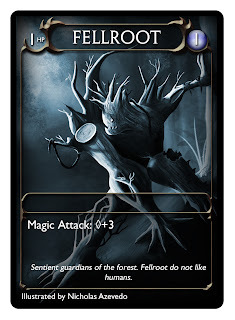 We discussed it at length and determined that while it may not be for everyone, the balance of luck and strategy works in this case and makes it so that every game is unique, but can leave players bored when they cannot strategize outside of their turn. Mechanically, the balance seemed appropriate, and the pacing worked well. I am very pleased at how the new Heroic Monsters work, the latest change I made to the game. Another topic of interest was the board layout, and Dave challenged my design choices. Afterwards Zak and I discussed it further and we agreed that Dave was right; my next update will be revisiting the board layout in an attempt to create more interesting avenues and decision-making. I'm looking forward to this as it's been a while since I've been able to flex my level design skills. Overall I'm very pleased with Dave's feedback, and my confidence in taking HeroCraft to a convention such as Arizona Game Day has increased tremendously. 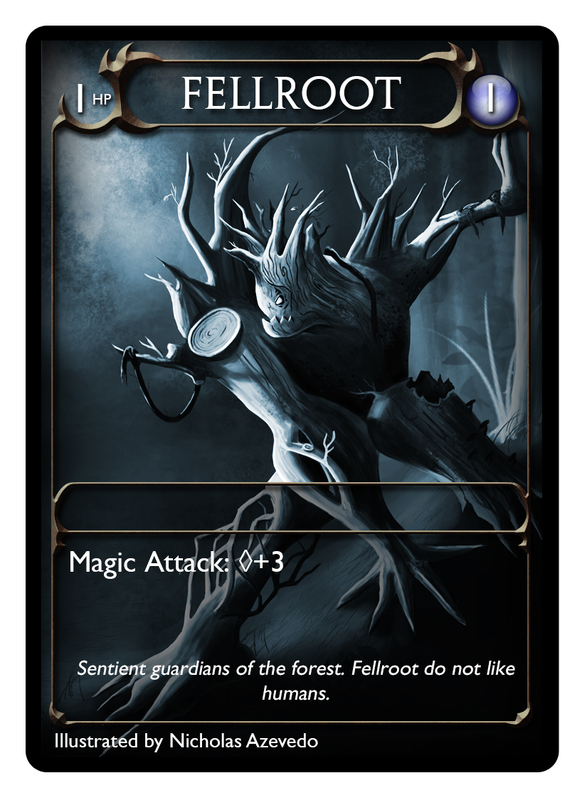 To close out this post, here is the latest card-art I've received: the Fellroot by Nick Azevedo.